As the earth & atmosphere age, our climate changes and evolves with them. One would expect that these changes affect coastal regions. According to the National Environmental Education Foundation, global sea levels have risen 8 inches since 1880 and are speculated to rise an additional 1 to 4 feet by 2100. This is due to melting glaciers, ice sheets, and increased snowmelt. There is also a natural process called “subsidence” in which coastal regions actually sink or subside under their own weight and subsurface tectonic forces which gives the appearance of sea level rise. This geologic phenomenon most often occurs near tectonic plates and large fault zones. Sometimes this subsidence can be caused by huge amounts of groundwater withdrawal as has been measured in the recent California drought. I’m sure you may be thinking “well I don’t live on the coast so that doesn’t matter to me,” or “what’s a few inches, it won’t hurt anything.” Unfortunately, this isn’t the case; inland communities will be impacted by this as well. So how will this affect the regions we serve? As sea levels rise, it is true that coastal communities will be affected first: increased flooding and shoreline erosion, for example, will be the front-line impact. For inland communities, the effects are more insidious: rising sea levels will push into our groundwater. Groundwater is the water that fills empty spaces and cracks under the surface, above permeable rock layers. The groundwater supply is “recharged” by precipitation, snowmelt, lakes or rivers and is withdrawn through wells. This is what supplies our regional water allocation, and water systems around the nation rely on groundwater as their main water supply. In addition to rising sea levels, changes in precipitation patterns also affect groundwater supply. We all learned the water cycle in school, but it doesn’t hurt to refresh our memories. 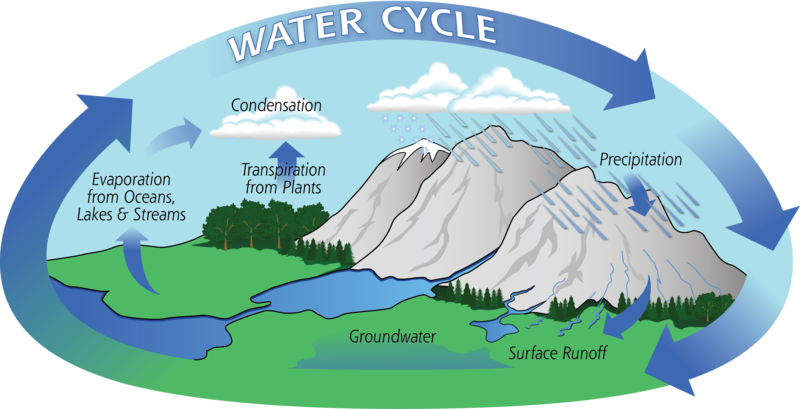 The water cycle is a series of processes by which water continuously travels between the Earth’s oceans, atmosphere, and land. It is important to understand is that while water is returned to the earth through the water cycle, it does not always come back to the same place or in the same quantity and quality. Warmer temperatures increase the rate of evaporation, which can dry out some areas, affecting the groundwater supply. Consequently, the increased moisture evaporated from one area will eventually fall in another, which could result in flooding. The combination of sea level rise, subsidence, saltwater intrusion, changes in precipitation patterns, and increased water use will affect our ability to utilize groundwater in the future. Remember, you don’t have to face your complex water and wastewater issues alone. We at SERCAP are committed to providing a variety of solutions to the water and wastewater issues in rural areas. To find out if we provide assistance to your area, or for more information, please reach out to us.